The voting in all 5 states of India has completed now, leading New, Media channels and survey agencies have released their exit polls of 2016 elections. 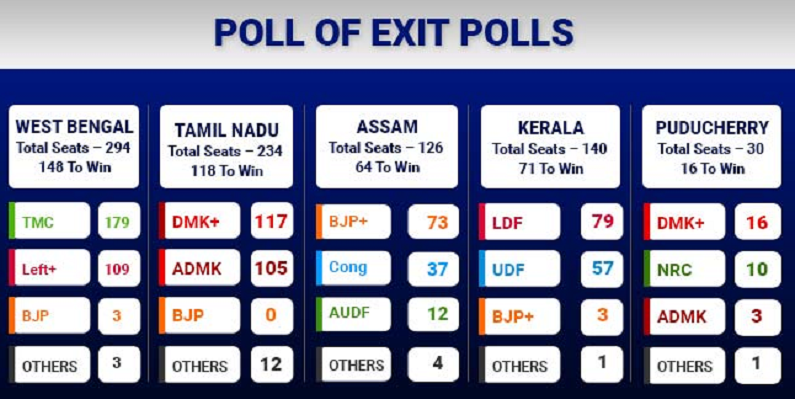 In this post, I am covering the exit poll of all the 5 states also a brief analysis of all the parties. Most of the exit poll and surveys are predicting that Mamta Banerjee’s TMC is going to win the 2016 Assembly elections. There will be a tough time for their competitor political party CPM. As per the polls, TMC will easily win 170-180 seats and Left+ party will win around 100-110 seats in West Bengal. There is no good news for BJP from west Bengal. BJP might able to win 3-5 seats only. 148 seats are required to form the government in West Bengal. As per Tamil Nadu exit poll, DMK+ has a slight lead over ADMK. Most of the polls are predicting that DMK+ will win 115 seats and ADMK will win around 105 seats. BJP will not able to open the account and Independents will get around 10-12 seats. It is interesting to see that who will win the TN elections. Total no. Of seats in Tamil Nadu assembly are 234 and seats are required to form the government is 118. If exit polls are to be believed then independents or smaller parties can play a crucial role in the formation of the government. As per Kerala Exit Poll, INC led UDF might have to lose the Kerala assembly elections 2016. LDF will win 75-80 seats and UDF will win 55-60 to seats. BJP and other wins 3 and 1 seats respectively. Kerala legislative assembly has total 140 seats and 71 are required to from the Government. Assam exit polls bring a bad news to current ruling party INC if polls are to be believed then BJP is going to form the government in Assam. BJP will easily win 70-75 seats of 126 seated assembly. Congress will manage to win 35-40 seats. UDF and other will win 12 and 4 seats respectively. 64 Seats are required to form the government in Assam. Pondicherry Exit polls are predicting that DMK alliance is going to win Pondicherry Elections. DMK will easily win 16 seats and current ruling party NRC will manage to win 10 seats only. ADMK and others win will 3 and 1 seats respectively. There are 30 seats in Puducherry assembly and 16 are required to form the government. As per the exit polls, all the ruling parties are going to lose the power in this elections except West Bengal Chief Minister and TMC supremo Mamta Banerjee. So we are all eagerly waiting for the assembly election results which are going to declare on 19th May 2016 (Thursday). It will be nice to compare actual result with exit polls.